The best way to introduce my new high quality printed retrospective book of 80 pages of words and 170 images of some of my creations, is to post the 'prologue' here below, along with pictures of the two 'front' covers. 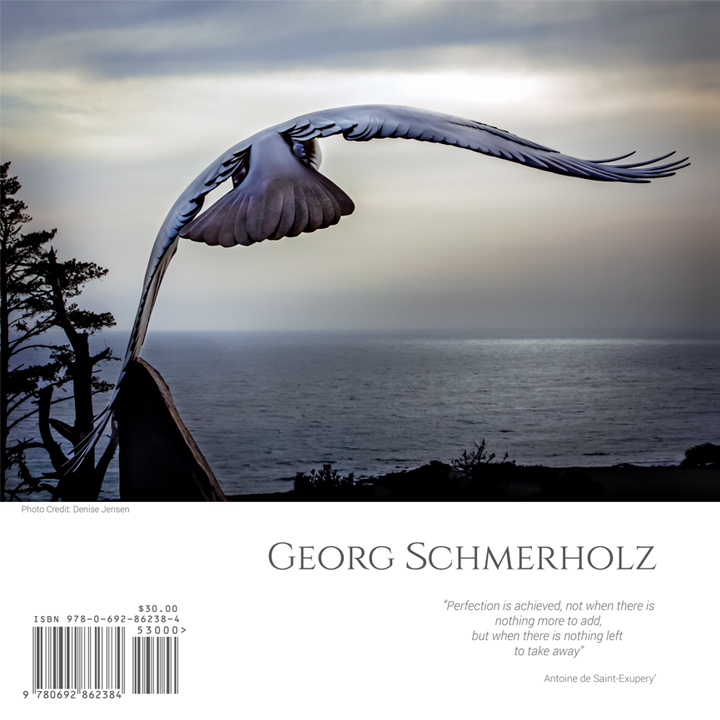 If you wish to purchase a copy, the cost is $30 US plus First Class or Media Mail (and tax if you live in CA.) Please contact me with your request and I'll send you a PayPal invoice. In my 40 years of sculpting, a prominent division exists between the first 30 years and the following 10, when I began to focus primarily on jade. How could I resolve this apparent artistic divide in designing this book? How could I present my sculptures in a way that demonstrates why these two periods of art creation, while seemingly independent from each other, are continuous and very much connected? Clearly, my jade carving could not have flourished without all the work that came before. 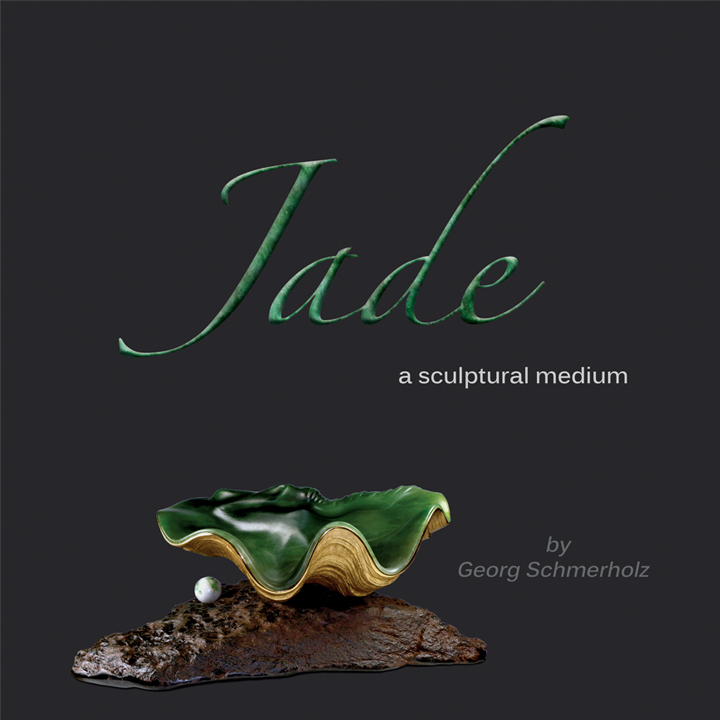 But my jade sculptures do stand alone. The answer to these questions arrived as most good solutions do: simply and spontaneously. The two phases of my story would be presented as two books in one, back-to-back, sharing a spine that binds them, just as they share a bond in my real life and work. Organizing my photographs and notes for this book, revealed life patterns and changes in my awareness. For instance, gradually over the years, a trend of combining different media emerged in my work. This artistic expression, while rooted in aesthetics, is also based on the understanding that everything is energy, frequency, and vibration. Nikola Tesla said this some 100 years ago, and physicists say it today. I have spent my life energy chiseling, chipping, sanding, molding, and seeking stone, and seeking inspiration. But for what? What have I really been doing, beyond simply doing what I love? I am a professional artist by definition, but what, exactly, is art? The answer remains debatable except for one consensus: art is a subjective experience for anyone who creates or appreciates it. My art is an extension of who I am, personally. Turn this page and the early years of my life and the 30 years of creating wood, metal, and stone sculptures compress into 41 pages of photographs and words. Open the Jade cover, and 10 years will expand into 39 pages, testifying to the range and depth of my work in this magnificent medium. For me, my art includes relationships with my clients, for whom I owe great gratitude for their much needed and much appreciated support. If you have commissioned works from me, you know that I come with my artwork. Not only have we shared the collaborative process, but we have remained friends long after. My art also includes my colleagues: fellow artists touched and tortured by the muse, brothers and sisters and by nature both competitive and cooperative. I spend many long hours working alone, so it is a great joy to meet them at art shows, symposia and other venues. I am so thankful for their being in my life. Showing our art to others is showing them what we are given from mysterious sources. For those of you who have not yet met and gotten to know me, I offer this book - both halves of it! May you feel the art and be inspired. I include no lists of exhibitions, honors, or corporate and private collections to get in the way of that. I want you to perceive these works in an unconditioned state of presence, and allow them to speak for themselves. Finally, my sculptures must be appreciated from all angles. For this reason, some of the works in this book are presented in multiple views to simulate their true three-dimensional spatial nature. I sincerely hope you enjoy these creations as much I have enjoyed creating them.